I give this lots of water and good indirect light. Native of Costa Rica or thereabouts. 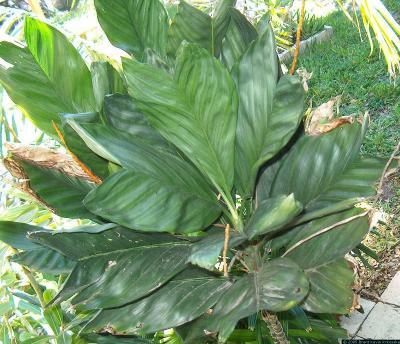 This palm will not pup, which will give you a five to eight foot tall plant with a tuft of leaves at the top and a big bare stem. It puts out root stubs all the way up the stem, so my solution was to wrap an ordinary plastic grocery bag around a point about a foot below the leaves, fill it with potting mix, and punch air holes in it. After about six weeks of keeping it moist, the bag was full of roots. I cut that off and potted it, and now it has a new lease on purty (that's 'pretty' for you non-Texan heathens). You can then throw the old stem into the compost pile, because it's not going to do anything else. The name 'metallica' is not a musical preference. When it's kept in a shady spot, the leaves take on a color that some people apparently think looks metallic. I think it looks kinda grey. The leaves thicken and widen, too. It can also be put in full sun, where it gets stocky and green, and won't grow as tall as quickly. This plant will bloom a lot. Seeds are few and far between for me, but occasionally viable.